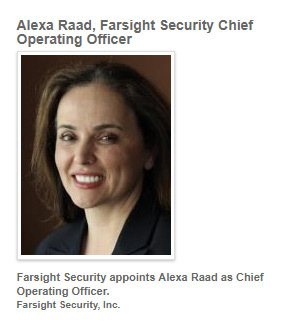 Alexa Raad, COO of Farshight Security. Prior to Architelos, Ms. Raad served as CEO of the Public Interest Registry (PIR), a not-for-profit corporation that manages the .ORG TLD and its database of .ORG domain names. Farsight Security is the world’s largest provider of historic and real-time passive DNS data, enabling security teams to qualify, enrich and correlate all sources of threat data during an attack or investigation. For the full text of this corporate press release, head over to FarsightSecurity.com.